Before the find of watermelon specimens from the Santa Rosa Mine people had already found other ones. Sr. Folch bought this in 1964 in New York and it is a good size with a deeper color than the ones from Santa Rosa. If we pay attention on the label date (1980) we could consider that this specimen must be part of the first “Watermelon” found in Santa Rosa. The crystal shows a marked color zoning and an excellent transparency and brilliance. 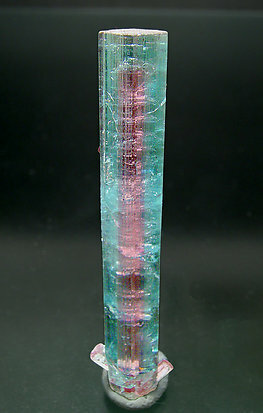 Prismatic crystal with an excellent termination. 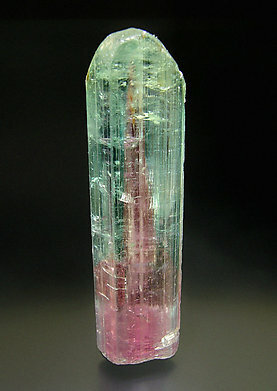 The color zonation is very well marked with the inner core between red and mauve and the bluish green exterior. It is curious to find this piece in the Folch collection because he purchased it before 1980, so it could be one of the first “watermelons” found at the locality. 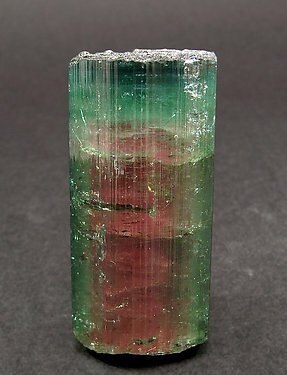 A prismatic crystal typical of Santa Rosa, with notable transparency and brilliance. This makes the contrast between the red interior and green exterior more notable. A classic that is now hard to find. 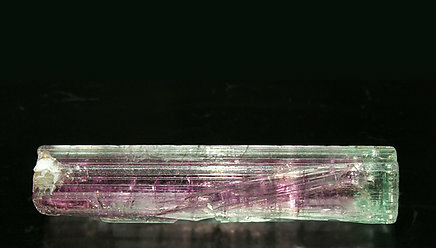 Prismatic crystal with the typical a flat pinacoid termination. 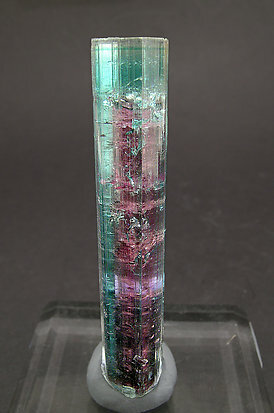 Very clear, shows a sharp zonation of the color, pink in the inner crystal and green-blue in the skin. Two little crystals below add a special esthetical beauty to the piece.